Pizza is one of those meals where it’s easy to be creative. You need your basic crust, sauce, cheese and toppings. It’s fun to mix and match all these elements and see what you can come up with. I enjoy experimenting when I cook. Sometimes, it works out perfectly while others dinner is a complete flop! 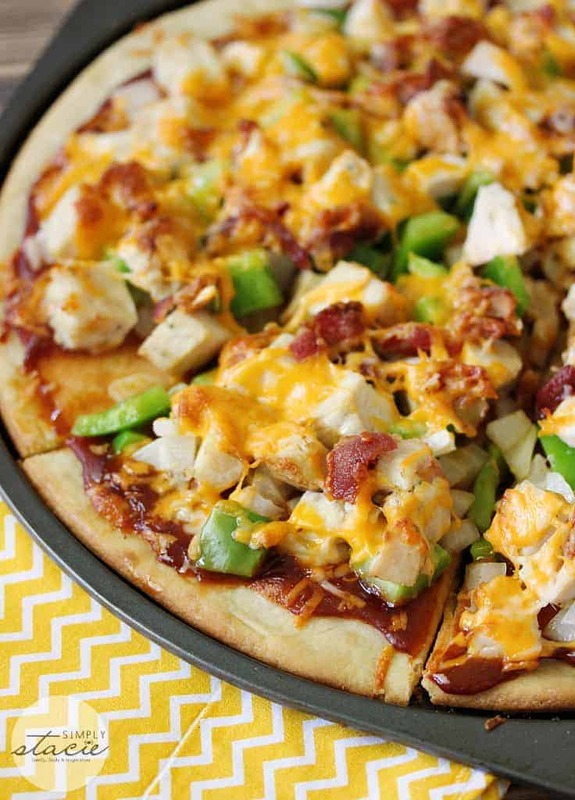 This BBQ Chicken Pizza is the former! We all loved it. Use barbecue sauce instead of pizza sauce. Food Basics had Kraft Barbecue Sauce on for $0.88 the other week so I grabbed a few. I can make more of this recipe and use it for our grilled meat recipes! For the chicken, you can use leftovers or if you really want to save time, buy the precooked chicken breast slices. Walmart has them for 2 for $10 right now. If you don’t have cheddar cheese, you can use mozzarella or marble cheese. When I made this pizza for supper, there was no leftovers. I’m not surprised though. It’s so good! 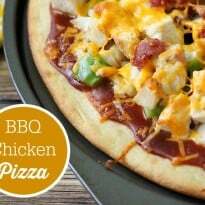 For more pizza recipes, check out my recipes for Sweet Chili Chicken Thai Pizza, Cheeseburger Pizza and Italian Meatball Pizza. Have you ever used barbecue sauce on a pizza? 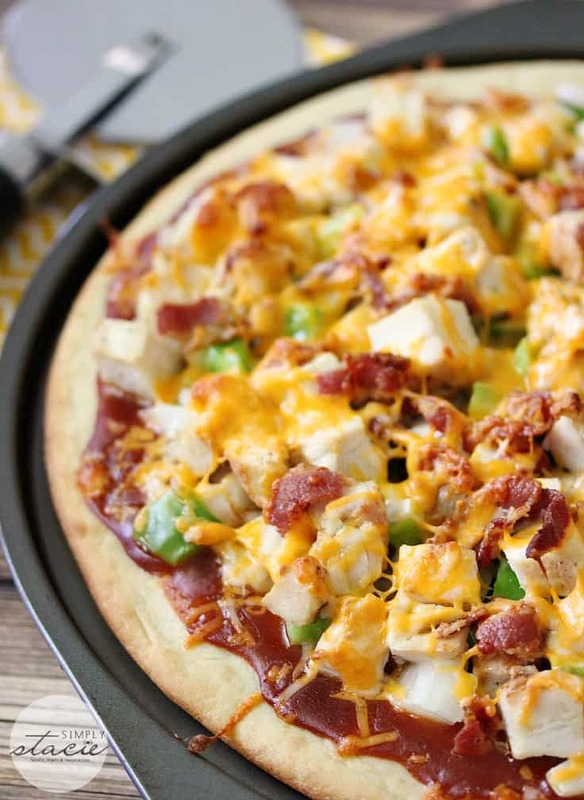 BBQ Chicken Pizza loaded with fresh onions, green peppers, chicken and bacon and smothered in barbecue sauce. This recipe is a keeper! Spread barbecue sauce over pizza crust, leaving a gap around the edge. Evenly distribute green pepper, onions, chicken and bacon over the sauce. Then top with cheddar cheese. printed and pinned a tasty looking quick meal for weekdays when there is little time, thanks! Sounds delicious. Wouldn’t have thought of substituting the barbecue sauce for tomato sauce. Thanks! We are always looking for new pizza topping ideas. We’re going to have to try this for sure! Looks great! BBQ pizza was one of my favorite things to make in college. I don’t think I’ve made it since. Yummy! A definite pin! Thank you so much for sharing at The Wonderful Wednesday Blog Hop! Yum, love the flavor combo! Looks great! I’m drooling. I love BBQ Chicken Pizza. I love that everyone can use whichever BBQ sauce they love. I have pinned it, oh and I’m visiting from Wonderful Wednesday Blog Hop. 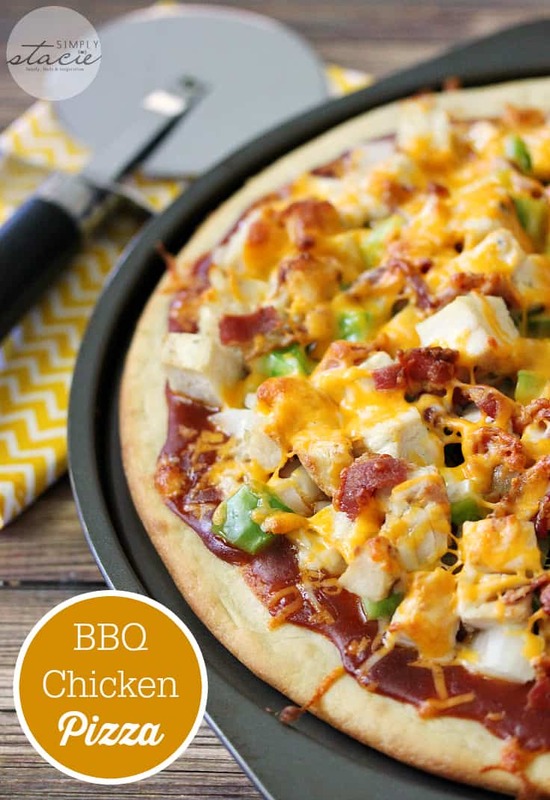 We love BBQ Chicken Pizza and this pizza looks amazing, we will love it! Hope you are having a great day and thanks so much for sharing your awesome post with Full Plate Thursday. I have barely cleaned up the dishes from dinner, and yet I am drooling over this pizza. It sounds wonderful! Yum- that is a perfectly delicious summer recipe! Thanks for linking up to the Handmade Hangout! Thanks for sharing this delicious recipe at Inspire Me Monday, Stacie – you made my mouth water!